What a great day yesterday. Lot's of people from around the state came to feed the gulls at Bayfront Park, it was the Taste of Duluth Festival. Fantastic. There was plenty of food for all, I especially like the caramel corn and hot dogs. People watching is one of my favorite pastimes, and if you pretend to be limping a bit, they feel sorry for you and throw even more food. I learned that trick from watching my friends. I also picked up this swell pair of binoculars. While I have good eyesight, with these, I can spot a dead fish over on Park Point without even leaving my perch. I just love summer in Duluth, it is so much fun. Yesterday I grabbed someone's parking receipt right out of the machine just for kicks. They loved it and everyone had a good laugh, especially the kids. Well, gotta get ready for today. I hope to find a fish sandwich with some spicy Italian tarter sauce. 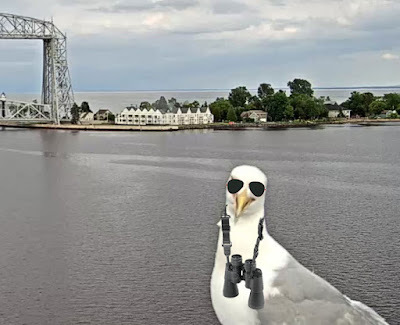 I should be able to spot them with the help of my new binoculars. I have a question off topic of Jeffrey. Sorry Jeffrey. When the ship are making that right turn to go under the 535 bridge why dont they swing wider? It just looks really close. thanks. There is actually a fairly narrow channel under the bridges. They don't want to cause an incident. Jeffrey those were my binoculars. Meet me by the canal and give them back or else you will become roasted gull for the fish you love. I loved yesterday's cool outfit but I understand you need the binoculars to spot folks you can play your tricks with. You are one clever bird. Keep up the good work, everybody loves and enjoys you! I just missed the Fraserborg will you post footage of the ship? Thanks either way.